This sugar free frappuccino is a healthier version of a classic favorite. Sweetened only with a homemade date caramel, you’d never know you were eating something good for you! Be able to cool down with a cold blended coffee drink without sacrificing your health of that summer bod you worked so hard on. Either way, I forced him to try one the first summer we were together – not only did I get him addicted to Starbucks over Dunkin Donuts, but I got him into Frappucinos. After at least a year (or more, if we’re being honest, guys.) of making fun of me for sipping on the intoxicatingly sweet icy drinks, I convinced him to try one and he was hooked too. The problem is that they’re pretty much the worst for you. Especially if you’re like me and love the ones with the gooey caramel sauce and whipped cream on top. If you try to limit your sugar intake, it’s pretty much impossible to justify slurping one down on any given day. And while they have a “reduced sugar” version, it’s really just a normal frappuccino made with the sugar free syrup and skim milk – it still had the sugary frappuccino base they use in a full sugar one. With that in mind, I went to work trying to figure out how on Earth to have my frapp and drink it too. Enter the sugar free frappuccino. You guys. This thing is amazing. When I first figured out how I thought I could make this work, Alex and I were driving around and I couldn’t get it out of my mind. I was so excited that that night I went out and bought everything I would need and the next day I started experimenting. And that was all I needed, one shot. While it obviously doesn’t taste exactly like a Starbucks Caramel Frappuccino (come on, everyone, it’s made with dates.) it definitely is so, so good. The strong flavor of the coffee covers up any super date-y flavors, and so much better for you! I looked it up, and a Grande Caramel Frappuccino contains SIXTY SIX grams of sugar. How crazy is that? While my version contains some natural sugars, there are no added or refined sugars, plus the dates add in some vitamins and fiber making it much more filling and satisfying. The trick really does lie in the homemade date caramel – it’s buttery and sweet without any refined sugars or artificial sweeteners. It adds that sticky caramel taste you love in a caramel frappuccino, but sugar free – yes, a sugar free caramel frappuccino. Doesn’t that just sound like the heavens opened up and sang? If your dates seem a little dry, you might need to simmer a bit longer. 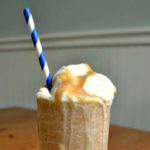 Any milk will work here – I used whole milk since it’s what we always have on hand, but if you’re looking for a dairy free frappuccino you could definitely use a milk alternative. Cashew and coconut milk would be a smart addition for the creaminess. If you want to add even more sweetness, add a few drops of stevia – if you use vanilla stevia omit the vanilla and just do a few drops of the vanilla stevia. This homemade date caramel is so, so good on everything from yogurt or ice cream to stirred into oatmeal. If you decide to give this sugar free frappuccino a try, make sure you let me know what you think by tagging me on instagram @morganmanages and rating the recipe 5 stars below! Boil the water and add in the dates. Allow to simmer 5 minutes. Add in milk, vanilla, and salt, and blend to combine. Cool completely before using. Add ice, milk, coffee, and date caramel (start with 2 tablespoons and increase to taste) to your blender and blend until smooth. Serve immediately with date caramel drizzle and whipped heavy cream or coconut cream for dairy free. If you'd like it sweeter, either add in more date caramel or add in vanilla stevia. I enjoyed my whipped cream plain with just the drizzle on top, but if you'd like a sweeter whipped cream, feel free to add stevia of sweetener of your choice. This can totally be made dairy free - like I stated above, I think cashew milk would work best because it's the creamiest and the most neutral, but I think full fat coconut would be crazy good as well! So tell me – what’s your favorite frappuccino? Are you as obsessed with them as I am? Sugar free friends – what do you miss the most? Let me know in the comments! This is brilliant! And looks delicious. Great recipe girl! This looks so good! Um yes please!!! That date caramel is such a great idea!!! I am totally sharing this! 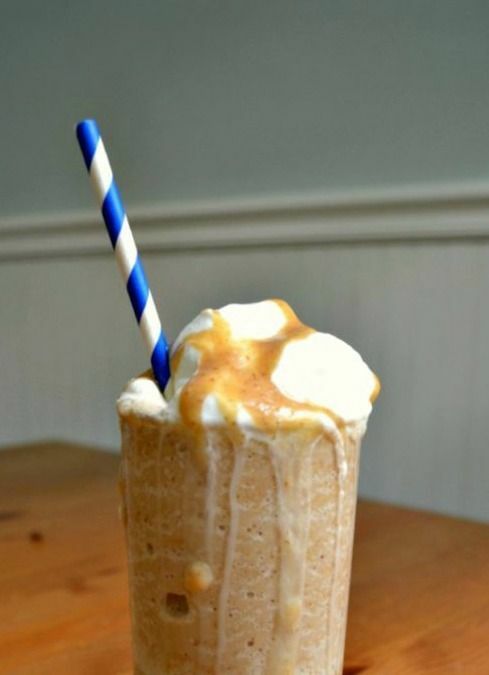 I love making my own protein frapps, but never thought to go so far as to add date caramel! This could be live-changing! Yum!!! Looks like a must try, same with those two ingredient Pina Colada popsicles! Yum! I’ve always shied away from doing something like this because I was too scared to try using my blender when all the recipes called for a food processor (which I don’t have). Really glad to see it worked for you. I bet the date caramel would be delicious over banana “ice cream” too! I bought myself a fancy Starbucks last weekend. Drank half, got to my friends house, she bumped into me & the whole rest got spilled on the floor. And I’m still upset about it. Whoa! That looks amazing! You got skillz, mama! I think you could have a future as a barista! 😉 Pinning for later! I have been trying to cut back on sugar so I have to try this! Pinned for later so I wont forget! Yum! This looks absolutely delicious! I will have to try it this summer. Please do!! Let me know how you like it! Oh wow, I didn’t see your other post about having to go off of sugar, but I’m really thankful that there are so many other ways to eat sugar like DATES! I would have never thought to put dates in a frappucino. This looks absolutely perfect, better than a Starbucks Frappe. Yes! I don’t think my body dig even natural sugars that much, but it responds (and recovers from quicker) so much better to natural sugars especially when paired with a protien like milk that I’ll do it! I need my frappuccino fix!! PSHHH! Who needs a coffee shop? I’m coming to your place! I am trying to be sugar free and it really is hard for me. I will have to try this. It sounds wonderful! It’s no joke!! Oh man, that first week was the worst – I had the full on withdrawal symptoms with headaches and everything. It’s easier now, but I sure miss my favorite sugar-y treats sometimes. I could have that every day! It looks so delicious! What a great, healthy alternative! This looks so good! I’ve attempted to make my own versions with sugar free syrups and stevia, but I love the idea of using dates to get extra fiber and vitamins! When I made it with stevia, I enjoyed it but I’m not a huge fan of sweeteners like that. The dates also helped thicken it, which is great! I wish I liked these drinks, but sadly, I don’t. They always look delicious and tempting, but then when I’ve ordered them, I wish I hadn’t. This is a great recipe for those that can’t do or won’t do sugar. You’re lucky, trust me! It’s not a cheap addiction, ha! Yum, yum, yum! I’ve been making a lot of homemade frappuccinos lately. They’re so much cheaper and healthier! I haven’t tried it with date caramel though. That sounds delicious! I also really lke knowing exactly what’s going into it, rather than a super vague “coffee base” ha! mmmm love that you used date caramel! delish! I’ve been sugar free for over a year now. What a unique twist to add the dates for sweetener! I can’t wait to try it. thanks! OMG! I love dates and I love frappuccino! This has my name written all over it! Pinned, Stumbled, Tweeted, that way I cannot misplace this recipe!!! You are the bomb! Perfect drink for a hot day, and we’re having those right now! Great recipe and perfect for summer! Thanks for sharing at #SmallVictories! Whoa! Sweetened by dates? I’ve never even heard of that! I’ll have to try it! Congratulations your great post has been featured in this weeks Friday Favorites linky party!! Please share with you social media…and thanks for linking up. I love healthy versions of not so healthy but FAVORITE things!! Thank you!! This frappuccino sounds so good! I can’t wait to make it! 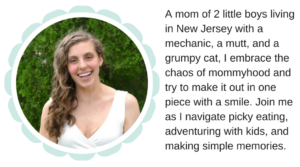 I’m glad I found you on Share the Wealth Linky!